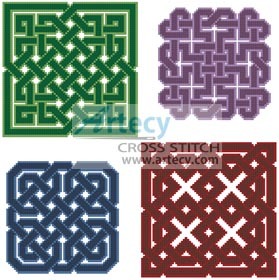 This counted cross stitch pattern of four Celtic designs was created from the Celtic Knot Font from www.Clanbadge.com. Finished size = Average Size for small patterns 4.5" x 4.5" using 14count or 5" x 5" using 18count. Average Size for large patterns 3.5" x 3.5" using 14count or 4" x 4" using 18count. Only full cross stitches are used in these patterns. It is a black and white symbol pattern.